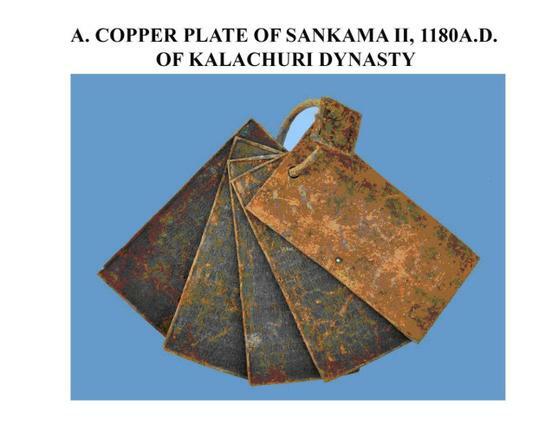 Copper Plate of Sankama Sankama II, 1180 A.D. of Kalachuri Dynasty ." Photo: Sreenivasa Rao /ASI. One of the three "Ane Gadyana" gold coins issued by Sivamara I (regnal years 679-726 CE), a Ganga ruler of Karnataka, found in February 2013 in a trial pit laid by the Archaeological Survey of India (Bangalore Circle) at the Mahadeva temple at Talagunda, Shimoga district, Karnatka." Photo: Sreenivasa Rao /ASI. 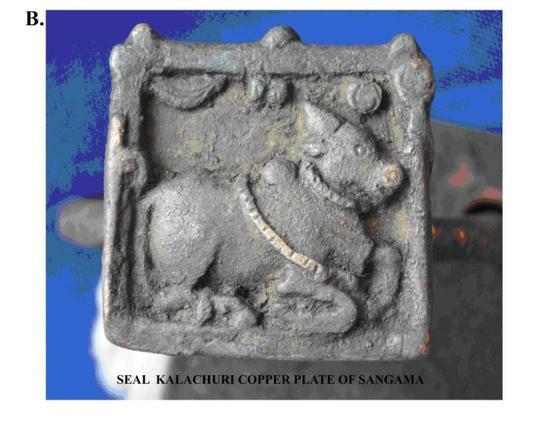 Seal Kalachuri Copper Plate of Sangama. Photo: Sreenivasa Rao /ASI. In a surprising find that may throw more light on the dynasties that ruled Karnataka, two sets of copper-plate charters and eight gold coins have been discovered at Pranaveswara temple at Talagunda in Shirkaripur taluq of Shimoga district by the Archaeological Survey of India (ASI) Bangalore Circle. 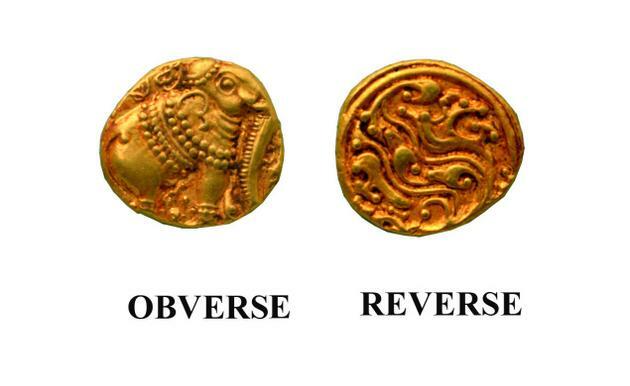 While the copper plates, datable to the 12 century CE, belong to the Kalachurya dynasty, the gold coins were issued by the Ganga rulers, who held sway in the State from the 4th century CE to the 12 century CE. The gold coins belong to the “Ane Gadyana” variety, portraying elephants on the obverse and floral designs on the reverse. They weigh around four grams each. Ganga ruler Sivamara-I (regnal years 679 CE to 726 CE) issued three of them. The ASI found the bonanza when it laid a trial pit in the south-east corner of the temple’s maha mandapa. The temple’s foundation had sunk and the nature of the soil had to be studied. The result was quite unexpected with the yield of the copper plates and the coins, said Superintending Archaeologist of ASI Bangalore Circle M. Nambirajan. The coins were “beautifully made and typical of the issue of the western Gangas,” he noted. The copper plates were found on February 11 the gold coins on February 16 and 17. The temple is datable to the Kadamba rulers of Banavasi, who ruled these parts between 4th century CE to the late 6th century CE. However, it has vestiges of the Satavahana rulers, taking back its antiquity to the 2nd century CE. The temple is simple in plan and elevation. It has a square sanctum, which houses a Shivalinga. As its foundation had sunk, resulting in the wall going out of plumb, there was need to dismantle and reset it. As the structure is situated in a heavy rainfall area, the soil’s nature and its foundation had to be studied. For this, the ASI laid a few trial pits. Its team, led by Dr. Nambirajan, comprised Mr. Keshava, Assistant Archaeologists P. Aravazhi and Teekam and senior Conservation Assistant Arjun Bangargi. A copper-plate charter has five leaves, each 28 cm long and 14 cm wide, held together by a royal seal with a beautiful engraving of a couchant bull. The plates carry inscriptions in Sanskrit and the script is in Devanagari. The other set has three leaves, each 24.5 cm long and 13 cm wide, with a Varaha (boar) emblem on the ring. Dr. Nambirajan said the copper-plates recorded the donations and gift of land in specified areas, to some Brahmins who were well versed in Vedic literature. It was issued by Kalachurya ruler Sankama-II in March, 1180 CE. Kalachuryas were a group of nomadic rulers, who ruled from Madhya Pradesh down to Karnataka, in the 12 century CE. “The significance of the discovery of the plates is that we have got more data on the Kalachurya rulers, their purpose of stay at Banavasi because they were issued when they were staying at Banavasi and we get authoritative data on the battle between the Kalachurya and the Hoysalas,” said Mr. Keshava. The ASI plans to excavate a big mound near the temple that may reveal the vestiges of the ancient township of the Kadambas.